In skillet, heat olive oil and butter, over medium heat. Saute onions about 3 minutes. 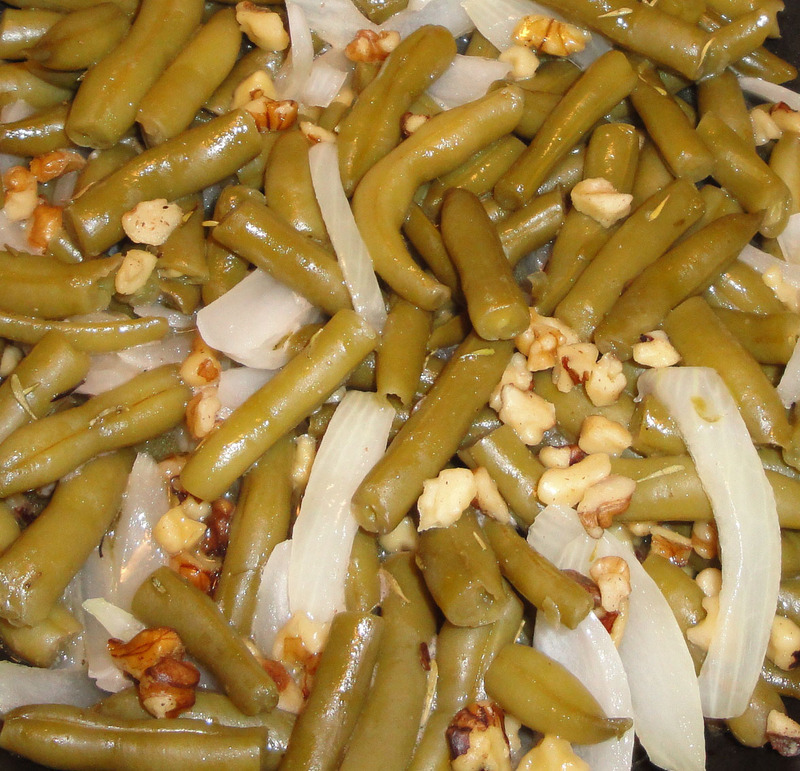 Add green beans and walnuts. Toss gently. Cook about 4 to 5 minutes. Add thyme and honey, toss gently. Enjoy! Oh these ARE fancy! Yumm! These look good (and easy to make with things currently in my house)! Christine, your recipe came at the perfect time -- company this weekend. I'm making these!!! A neat bit of history behind thyme, too -- no wonder it's in so many recipes this time of year! Yum! When I was a kid, my mother made green beans ALL.THE.TIME. so it took me a long time to eat them as an adult. But now I love them again and these sound delish, Christine! Let me know what y'all think. Enjoy! I just cooked with fresh thyme the other day and forgot just how perfect an herb it is! And green beans have always been favorite. I'm sold! That looks really good and I learned about thyme. I'm quite used to seeing almonds in green beans but not walnuts. I prefer walnuts so this totally works for me. Ooo, yes, these are fancy pants! I looooove green beans and look forward to any opportunity to eat them up. Thanks for this great recipe! I love thyme...it's amazing that such a small herb can pack such a flavor punch! So easy to cook.Great recipe. Simple and very healthy way of preparing the beans. I still have lemon thyme growing in my herb pots on the patio. I'll have to make these fancy green beans soon, before Jack Frost comes! Love this ingredient blend! A new recipe for green beans is always welcome. Thanks for sharing this one. Buzzz! Great side dish for the holidays. hi christine, over here we have abundant green beans, so we get them fresh and they were never sold frozen.. something i learnt from blogger friends, is that we have differences in lots of foodie ingredients due to geographic locations..very interesting. These beans look delicious, Christine! The perfect side dish! Looks super yummy. Green beans were one of my Dad's faves so we ate them tons as kids. You just brought back some lovely memories. Thanks for that. Great idea Christine. The walnuts are a nice touch for those that are not meat eaters too. I like thyme and use them a lot in baking. Gotta try them in beans next time. This does look fancy and appetizing! Thank you all for all the warm comments. Love how you always give us some history with your recipes. The beans look great!